Vitreous enamel steel surfaces compared to other surfaces. Vitreous enamel is odourless, tasteless and non-toxic. Although Painted Steel or Formica options may provide for a more economical alternative in the short term, the use of Painted Steel or Formica as writing surfaces is not recommended, particularly in high use areas (such as teaching institutions), as the surface is susceptible to both Loss of Texture and Ghosting, leading to the necessity to replace the boards in a relatively short period of time. Vitrex has been manufacturing writing surfaces for over 50 years and we are happy and proud to guarantee our vitreous enamelled steel writing surfaces and workmanship, in respect of normal usage, against fading of colour, deterioration or failure of component vitreous enamelled parts over a period of 20 years. In addition, the use of Painted Steel or Formica as writing surfaces is also not recommended in hygienically sensitive environments such as laboratories and hospitals, as these surfaces allow for the absorption of dirt and grease, thus creating ideal conditions for the presence and growth of bacteria and mould. 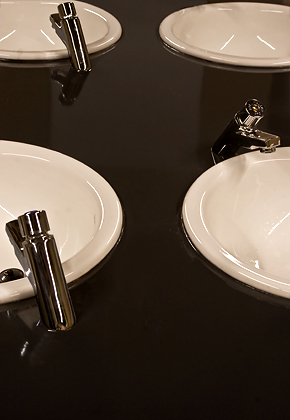 Due to the absence of pores the smooth, hard enamel surface eliminates the absorption of dirt and grease, reduces the presence and growth of bacteria and mould, therefore creating a more hygienic and healthy environment. Independent comparative studies have shown that in this respect enamel outperforms other materials and coatings, including stainless steel. Enamel does not absorb or transmit odours or flavours. Surface contamination can be removed quickly and easily by simply washing with commonly used germicidal solutions and can be sterilized with steam without damage. Click here to download a report (139 kb) explaining the superiority of vitreous enamel steel surfaces when compared to the use of HPDL Formica and Painted Steel surfaces. Click here to download a bacteriological study (56 kb) comparing a variety of surfaces, including vitreous enamel, carried out on behalf of CISP the Italian Vitreous Enamel Association. Although the Melamine or Formica options may provide for a more economical alternative, the use of Melamine or Formica faced chipboard as the finished surface of toilet cubicles is not suitable for high traffic, hard wearing areas that may be subjected to the possibility of vandalism and are not suitable for any application in wet areas. Click here to download a report (183 kb) explaining the superiority of vitreous enamel steel surfaces when compared to using melamine and formica surfaces in high traffic areas.